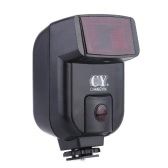 Support wireless flash trigger, transceiver integrated. 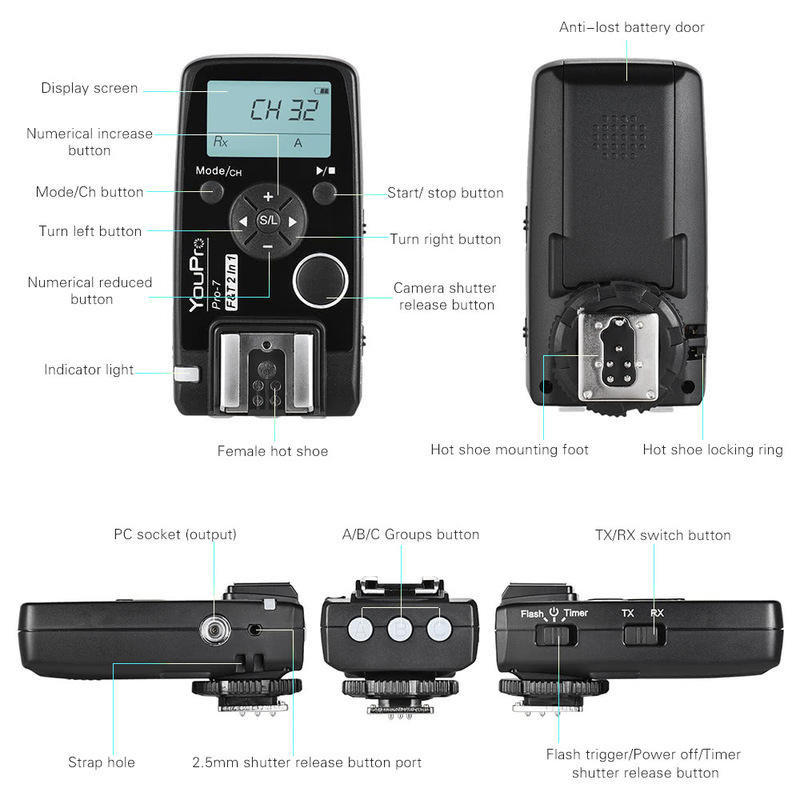 Support wireless / wired shutter remote control. 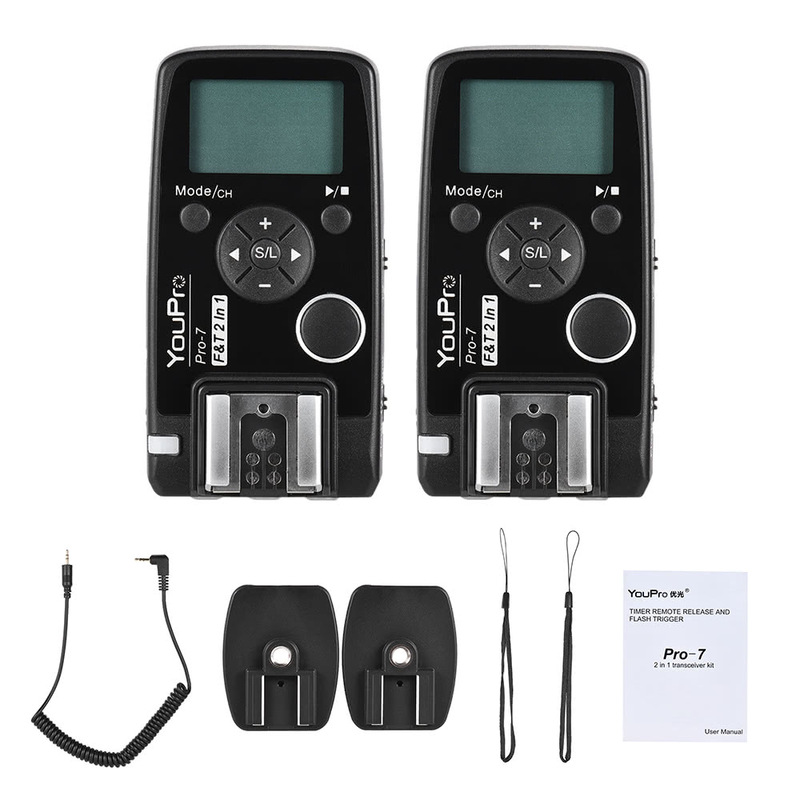 With wireless timing shutter function. 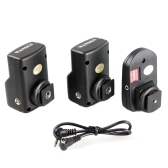 FSK 2.4GHz wireless shutter remote system can be more effective to guarantee speed, distance and stability. 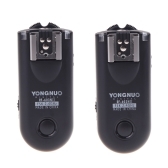 Its remote control distance may reach to 100m in capacious areas. 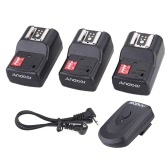 Pro-7 wireless flash trigger kit is formed by two same transceivers. 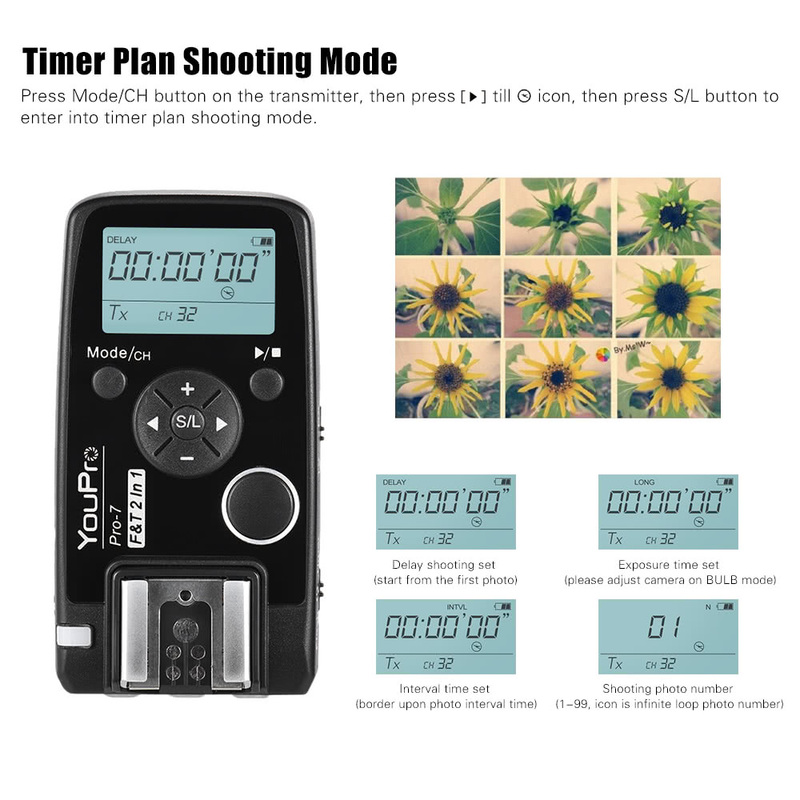 It can be set to single transmit state (TX), which will be more convenient for testing flash, and can be set to transceiver state (RX), automatically switch transmit and receive state, adopts focus and shutter function in "TX" and "RX" state respectively. 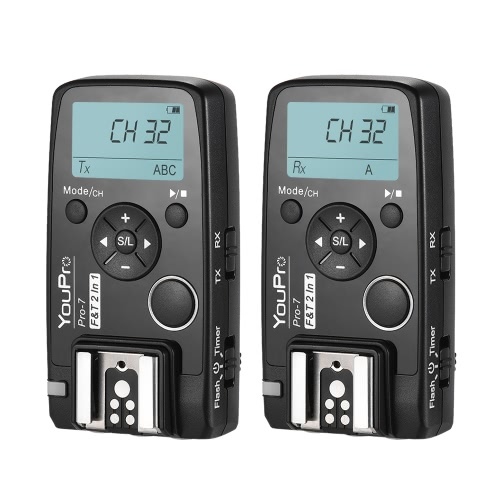 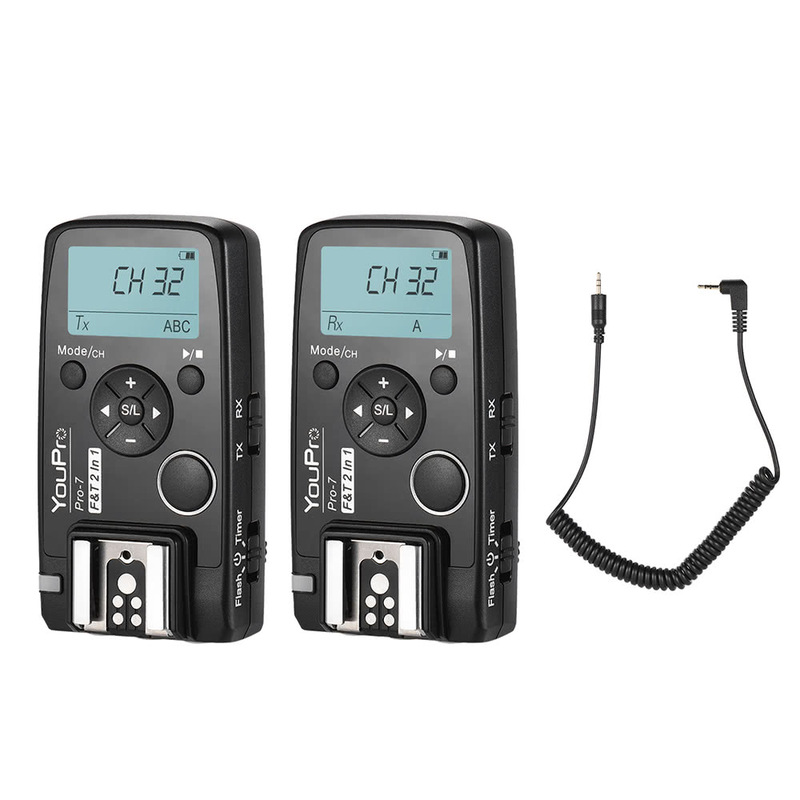 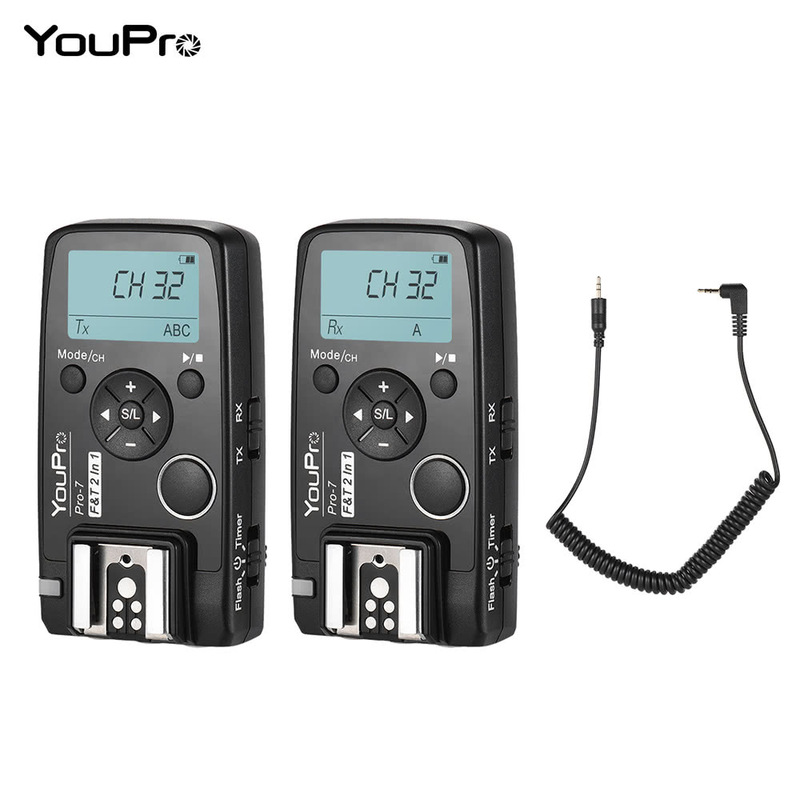 Pro-7 kit has flash trigger and timer shutter release two modes, can be switched by the button. 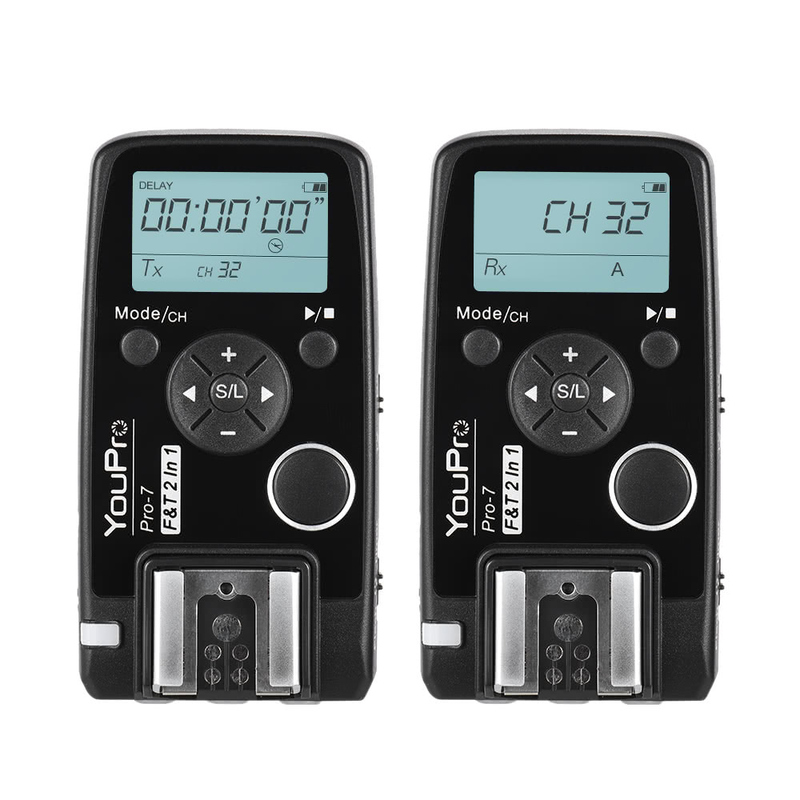 Also has a high resolution display screen, easy to operate via the screen. 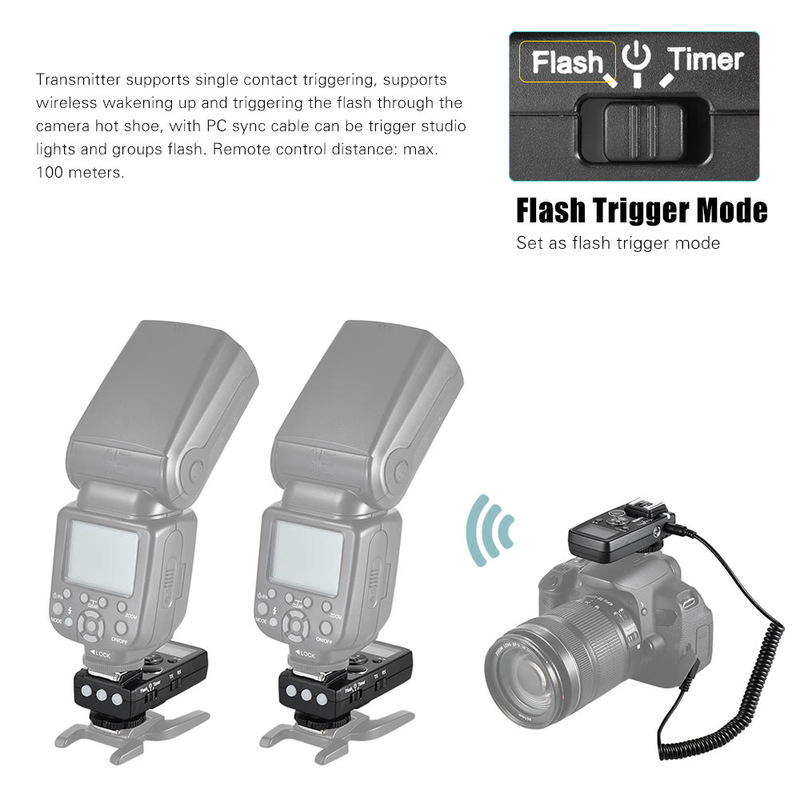 On flash trigger mode: Transmitter supports single contact triggering, supports wireless wakening up and triggering the flash through the camera hot shoe, with PC sync cable can be trigger studio lights and groups flash. 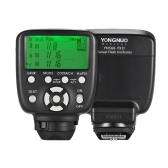 The highest flash sync speed is up to 1/320s (some of models may only reach to 1/250s or less, different combination of models of flash and camera using may achieve different flash sync speed). 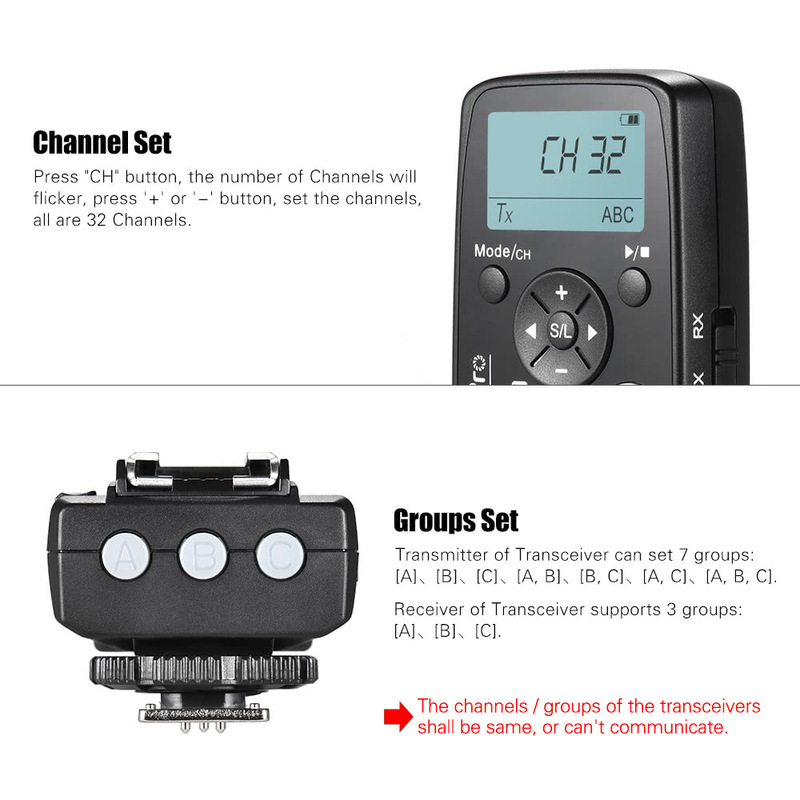 With A/B/C 7 Groups and 32 Channels. 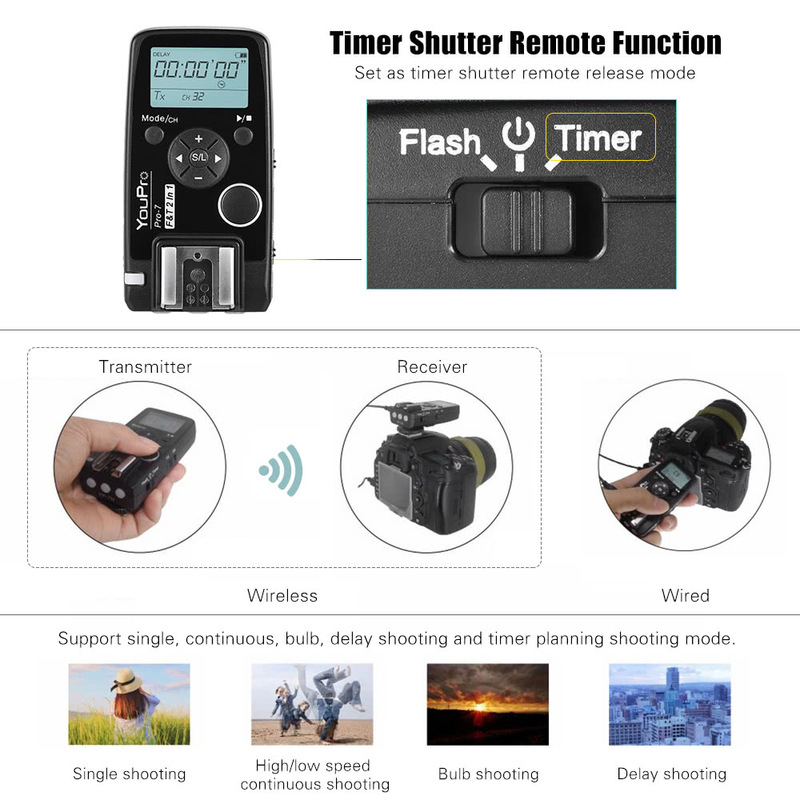 Shutter remote release mode: Plug the different cable to work with wired/wireless, support single, continuous, bulb, delay shooting and timer planning shooting mode. 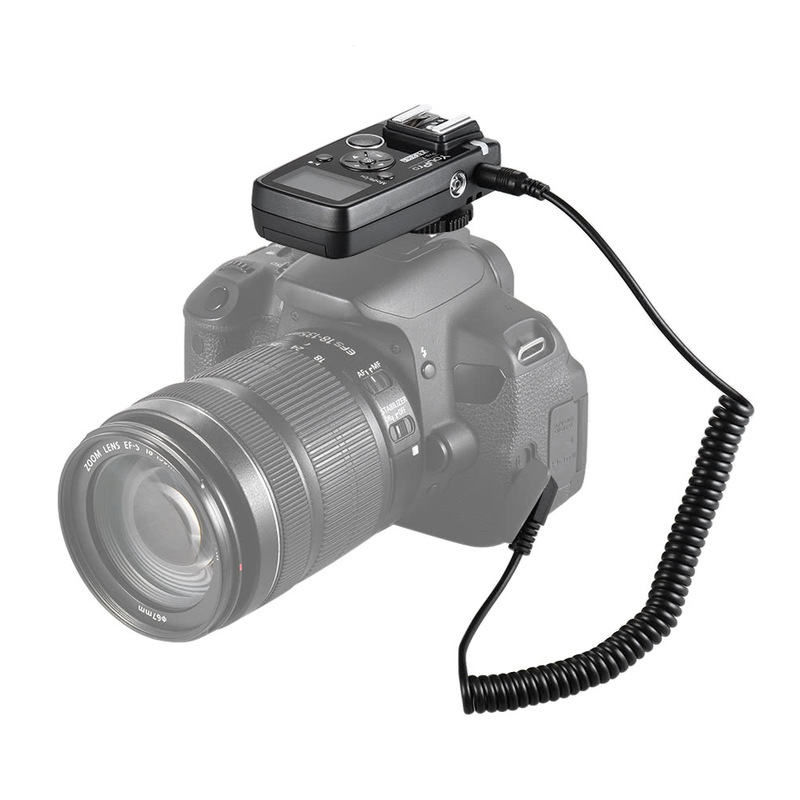 Comes with E3 PC sync cable, suitable for Canon 80D 77D 800D 760D 750D 700D 650D 600D 550D/ Rebel T2i T3i T4i T5i T6i T6S T7i 1300D 1200D 1100D 70D 60D cameras.